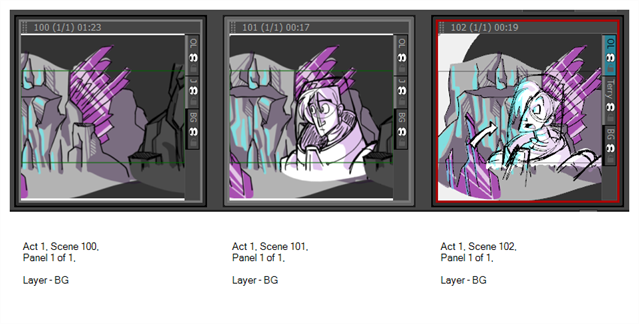 You can import one or more images and have Storyboard Pro automatically create a new scene for each. This useful when you have a series of bitmap images that you need to include, such as backgrounds or scanned storyboards. NOTE By default, when importing images in Storyboard Pro, the images are vectorized in colour and imported in vector layers. You can access more vectorization options by enabling the Display Vectorize Options Dialog preferences—see Importing Images as Layers. Name: This is the name of the project. This string will not be inserted into the Storyboard Pro project, but it is mandatory. A: Indicates the act the image will be placed in. Replace the # with the number of the act. S: Indicates the first (or only) scene the image will be placed in. Replace the # with the number of the first scene this image will be used in. E: (Optional attribute) Use this attribute along with the S attribute if you want the image to be included in multiple scenes. Replace the # with the number of the last scene this image will be used in. P: (Optional attribute) This attribute is to indicate which panel the image will be placed in. Replace the # with the number of the panel in the scene. L: (Optional string) This string is to indicate the name of the layer where the image will be placed. Replace the # with the number of the layer in the scene. Select File > Import > Images as Scenes, and browse to the location on your computer where your images are saved. A drawing is scanned and named like this: RocketRodeo-A1-S100-E102-P1-LBG.jpeg.